FilmDoctor® is the ultimate software for physical characterization, engineering, and optimization of arbitrary structured surfaces! It enables you not only to exactly dimension but also physically evaluate surface or contact measurements in order to mechanically characterize the surfaces. This is absolutely necessary for engineering or optimization of any surface by means of physical modeling and simulation. Of course, FilmDoctor® is equipped with such functionalities as well. 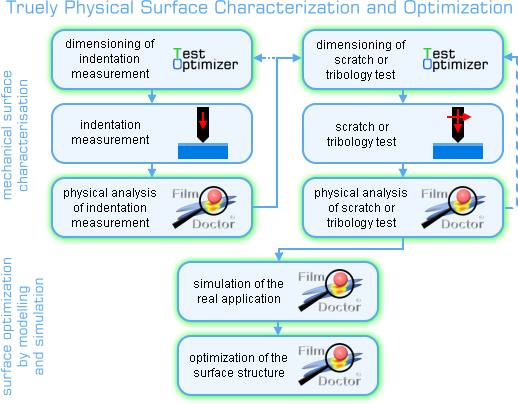 Thus, FilmDoctor® allows you to cut time-consuming and costly testing for coating engineering or optimization on the one hand and to increase the certainty of your durability prediction significantly on the other hand. Application-oriented design or optimization of surface structures requires appropriate dimensioning and physical analysis of contact measurements for mechanic characterization. The ultimate FilmDoctor® Studio allows you to perform all these tasks. * With regard to measurement analysis it practically depends on capabilities (e.g. the resolution and noise floor) of your measurement instrument. Will be customized meeting your needs (>50000€)!